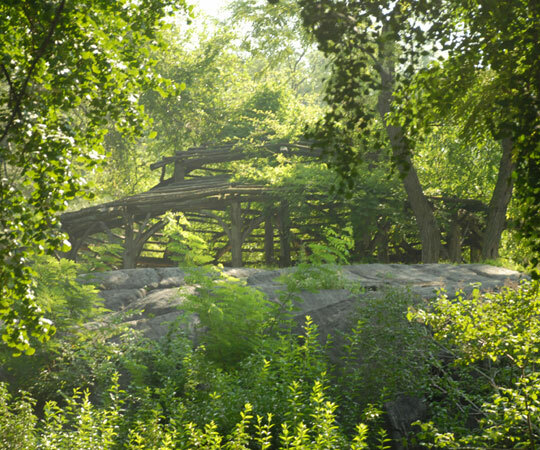 Have you ever noticed – or climbed – Central Park’s impressive rock formations? Although it’s true that the Park is manmade, the rocks that you see are not. They are exposed portions of ancient bedrock – solid rock that lies under soil and other loose surface materials. The bedrock found throughout New York City ranges in age from 190 million to 1.1 billion years old, and many of the outcrops you see in Central Park were shaped by ice. The land on which Central Park was constructed featured an unusually large amount of exposed bedrock, which heavily influenced how it was designed and built. To construct the Park, workers excavated, removed, and reset about 476,000 cubic yards of rock. Much of it had to be blasted away in order to create the Park’s four sunken transverse roads that separate west-east traffic from the landscape. Frederick Law Olmsted and Calvert Vaux, the Park’s co-designers, took advantage of protruding bedrock formations. Some outcrops were crowned with rustic shelters or other structures to emphasize their presence in the landscape, making them focal points as well as viewing platforms. The most impressive outcrops received names such as Summit Rock and Vista Rock. Many were enhanced with stairs (likely through chiseling). Summit Rock is a massive outcrop and the highest natural elevation in Central Park. Summit Rock originally commanded a view across the Hudson River to the New Jersey Palisades, making it a logical place for Olmsted and Vaux to provide both a carriage and pedestrian overlook. Although the view has been reduced over the past 100 years to a sliver along West 83rd Street, it's still worth pausing to relax on one of its benches. 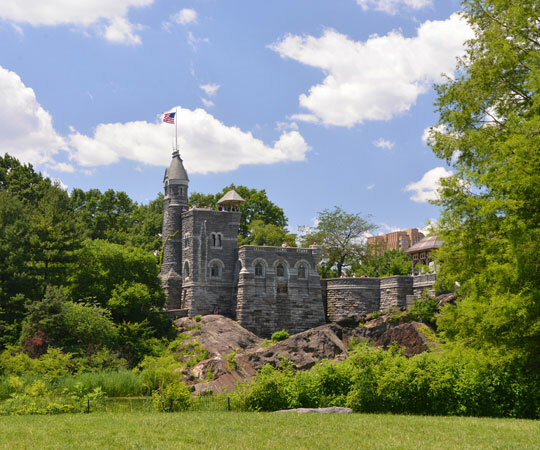 Olmsted and Vaux saw Vista Rock as the perfect site to construct Belvedere Castle, a Victorian Gothic castle built largely out of schist excavated from the Park. The National Weather Service also considered it a prime spot, and since 1919, temperature and wind speeds have been recorded here. The Belvedere provides the best and highest views of the Park and its cityscape (“Belvedere” translates to “beautiful view” in Italian). Umpire Rock is named for its commanding view of Heckscher Ballfields to the north. Olmsted and Vaux originally planned to build a rustic structure atop Umpire Rock, although the structure wasn’t realized. Today, Umpire Rock also contains spectacular views of Midtown’s skyscrapers and neighboring Heckscher Playground. It’s a popular spot for bouldering. The 79th Street Transverse is one of the four sunken roads that cross Central Park from west to east. 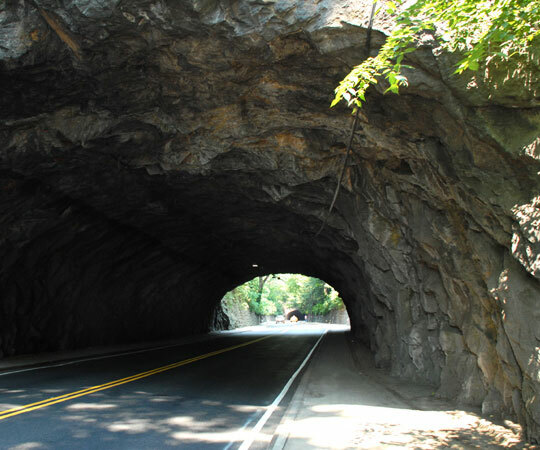 The road contains a tunnel – just south of Belvedere Castle – composed entirely of bedrock. The tunnel was such an attraction when it was completed in 1861 that a small stairway was constructed southeast of the Belvedere to allow visitors to reach the tunnel and admire this architectural wonder up-close. Sitting atop a large outcrop near Central Park South is Cop Cot. Designed by Vaux, Cop Cot is the Park’s largest rustic structure, and a great example of Olmsted and Vaux’s goal to highlight exposed bedrock with extravagant rustic architecture. Peek behind Cop Cot on its northeast side for an example of stairs that have been chiseled into the exposed bedrock. 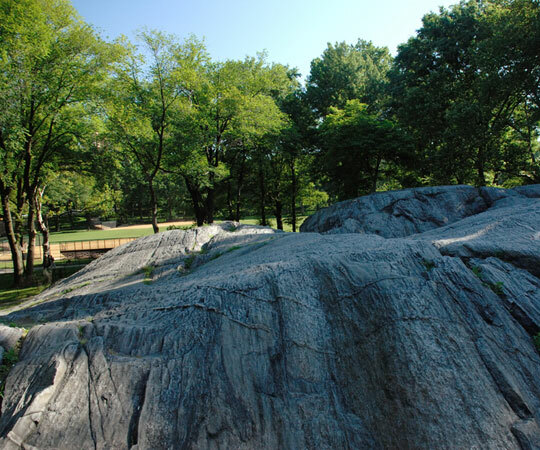 Next time you wander Central Park, take notice of its magnificent rock formations. 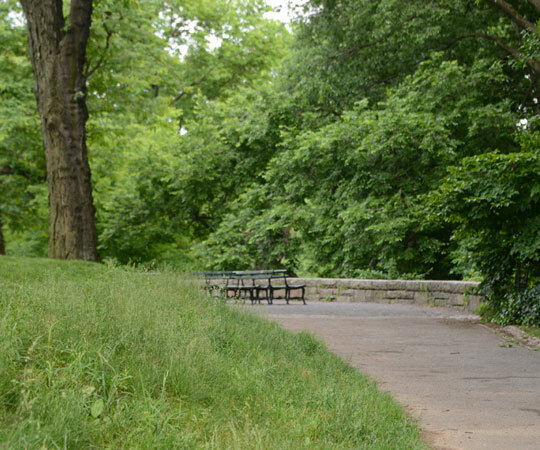 Whether you’re climbing atop Umpire Rock to watch a softball game, relaxing in Cop Cot, or admiring the distant views from Summit Rock, now you know how New York City’s bedrock became such an integral part of Central Park’s history.